The battle between print and digital has been going on for some time and while we still think it’s far from being over, the statistics are pointing out some interesting aspects, scoring points on both scoreboards. Let’s take a closer look at some of the most important battlefields and see the evolution of both print magazines and digital magazines. How did print magazines and online magazines appear? Even though, if we think about it nowadays, print usually equals paper, this wasn’t always like this. Remember when writing used to be done on walls, and patterns are printed on clothes? Prepare for a long trip back in time. The earliest print samples consist of Cylinder seals, woodblock printing, and handwriting. Print had later a huge evolution, during the Printing Revolution when Johannes Gutenberg introduced the mechanical movable printing, often considered to be the most important invention of the second millennium. Gutenberg’s invention played a key role in the Renaissance-Reformation and the Age of Enlightenment, putting the basis of modern printing. Modern printing also includes things like newspapers printing, flyers, magazines, catalogs, photograph printing, clothes or any other type of object, including cars. While print seems to have been with us since forever, digital came to greet us around 20 years ago. Even though the difference in age between them is quite obvious in the favor of print, digital has gained a lot of ground and has grown impressively. One of the first print magazines that switched to a digital format was actually Datamation, a computer magazine. Between 1952 and 1998, this publication was a publish in print type of magazine. Ever since its appearance has moved on the web and is still going on strong. Nowadays, creating a web magazine is simpler than ever. Using magazine creators, digital newspapers, e-books, brochures and so on, are designed in a heartbeat. How did print influence digital and vice-versa? Ever since digital made its appearance, people say that print magazines (and print in general), are going to die. But this rumor has been going around for a while, and yet, book printing services are still profitable. So how come print is still around when the predictions were talking about planning its funeral? Remember when the motion pictures started to grow. What about the time when the TV became available, and later on, affordable. Everybody was saying that theater doesn’t stand a chance against this. Here we are, in 2017, and theater plays are more appreciated than ever, and television is still a huge influence in people’s lives. The main reason behind this situation is the fact that TV/cinema and theater, usually have different target groups. They are not entirely different, but their intersection area is quite small. This applies to digital vs print as well. While the more artsy people tend to enjoy an old school book, its feeling, and smell, the tech savvy individuals are tending to choose the digital. And that is perfectly fine. There is plenty of room for all of us and plenty to choose from regardless of our preferences. Depending on the source, this battle is won by one or the other, so we can easily admit that it is far to be over. But why do we perceive this as a fight, instead of considering a cohabitation? Let’s take a look at Sports Illustrated, for instance. The famous magazine started off with one printed issue per month. Nowadays, they have both. Moreover, a few years ago, they decided to cut the print-only subscriptions. This way, they encourage people to purchase both of them, so that they will experience their content in different ways. It paid off, since Sports Illustrated is still one of the best sellers within America. But what do you think people love about either one of them? Let’s find out and compare them step by step. We all know that friend that we just met a couple of months ago but he is already acting like you’ve known each other for over a couple of years. Your immediate reaction is to take a step back, as you might feel like your space is being invaded, so you will automatically feel reticent. According to a study conducted by Freeport Press, back in 2016, over 40% of people still read 1 or 2 print magazines and only under 30% admitting to reading digital magazines. Having said this, another study conducted by the UK Bureau of Circulation is informing us that the print circulation has been going down with 4% every year. On the other hand, digital editions of The Economist or the Daily Mirror registered a massive increase in their year to year reach. So, while people say that they trust print the most, numbers say something different. Why? Because of convenience. Digital magazines are not only accessible from your PC, but even from your smartphone or tablet. And you don’t even have to walk to the news stall to get it. It’s just a click away. Money has always been a sensitive issue no matter the domain. Business owners want to save money, realtors want to ask and distributors want to charge as much money as possible and the list can go on. 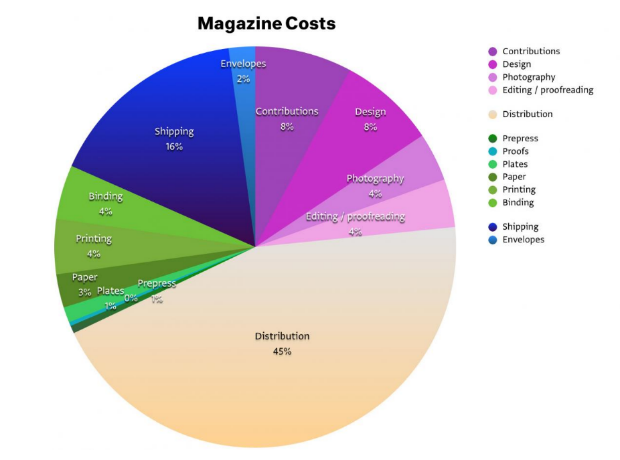 Having said this, print magazines and online magazines have different costs and usually build their budget differently. If we take a look at workthatwork, print magazines costs include contributions, design, photography, editing and proofreading, prepress, proofs, plates, paper, printing, binding, shipping, envelopes and last but not least, distribution. As you can see in the diagram, distribution is the most expensive, leading the costs with 45%, worthing almost as much as all the other ones together. Print magazines usually take funds primarily from Magazine Sales 77%, and adverts, trying to reduce the cost of patrons as much as possible. 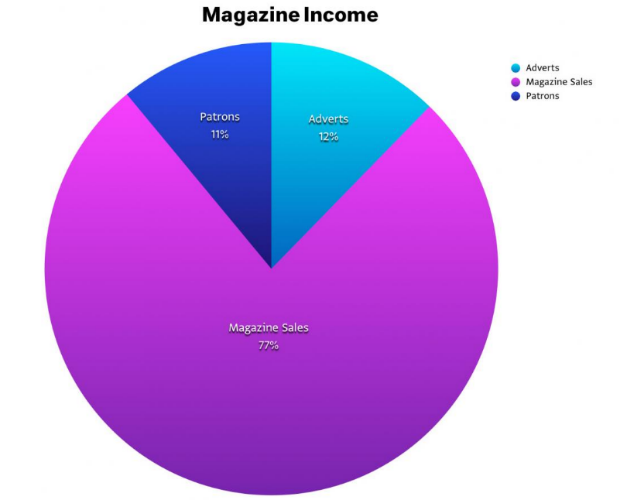 If your magazines are doing good, the investment of the patrons should get lower and lower by the issue, and eventually end up excluding it for good. While the percentage of adverts in a magazine print design is usually maximum 5%, the fight for that small percentage should get bigger and bigger, thus raising the cost per page. This means, the cost of purchasing the magazine will get lower, and the patron’s contributions will be completely excluded. On the other hand creating online magazines, involves other costs. You might be tempted to think that if you want to create your own online magazine, it would be free of charge. You couldn’t be more wrong. The costs include editorial creation, content writing, design, software, circulation, marketing, hosting/bandwidth. As you can see, the cost of publishing a digital magazine doesn’t include the biggest “spender” of the other one. But there are plenty of other expenses that will cover for it. Moreover, digital publishing costs can vary depending on administrative strategy. You can come up with a magazine using a free online magazine maker and online magazine templates and hope for the best or invest in valuable software and in the optimization of the user experience (which can be pricey, by the way) and go straight to the point, thus leading to a higher profit. The situation is a little different in comparison with print. If you take a closer look at virtual magazines, you’ll see that the ads are there, except they are not. Most online magazines don’t host adverts, and that has a big impact on their budget. That means, all the weight lays on the patrons and the sales. This explains a lot. 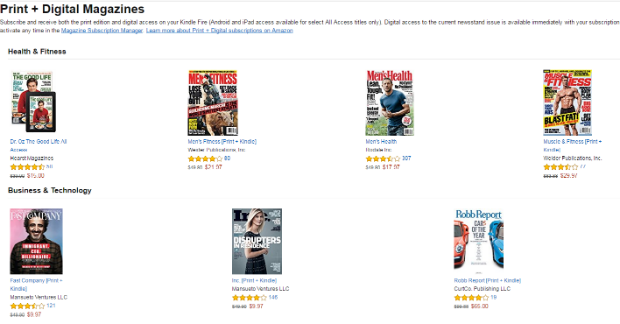 Most people don’t understand the higher price of the digital magazines, but this explains it. Taking ads out of the equation will push the price to the upper limit. Whenever you ask people what is their favorite thing about print books, 90% of them will think about the paper feeling. Yes, the famous paper feeling. The sensorial experience is what people enjoy the most. The touch, the smell, the feeling of an old book touching their fingertips. If we could point out one thing that digital magazines are missing, this would be it. And the industry had been trying to this for year and years. The flip effect the closest thing to reality, and it has been a huge success, together with the sound that comes with it. On the other hand, virtual magazines have a lot more to bring to the table. For instance, one of the most useful things about them is the fact that it allows the reader to go further with finding more information when wanted. Digital materials usually provide a source or a link, in order for the reader to read more about it, in a larger piece (such as an article). Of course, paper can cite too, but you can’t do it instantly, right then and there. If we were to designate a certain era to each of them we would probably pick the past for the print and the present for the digital. That is because they each had their finest moments during those times. But what about the future? What do you think is going to happen and how are things going to evolve? One one hand, we established that print tends to be more trustworthy and a little less expensive, while being less reachable, convenient, and doesn’t allow users to further dig for more information. On the other hand, we have digital magazines, who excel at flexibility, convenience, accessibility and information sources, but lack a little at trust and budget. We think print will always have its place in this industry, and whoever will call it an oldie, we’ll reply to them with goldie. At the same time, digital magazines are not going anywhere since technology keeps evolving and keeps being more present and involved in our everyday lives. The co-existence is already being contoured since a lot of magazines are playing on both fields. Don’t believe us? What about Allure, Vogue, Deer&Deer, Inc. or Men’s fitness? Alright, let’s face it, we’re not psychics. What is your assessment on this? What do you think the future holds for both print and online magazines?